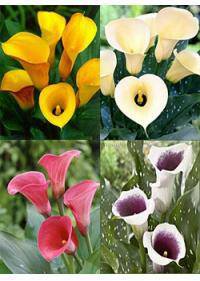 The calla lily is frequently known as an Easter lily in many places. This is often due to popularity as a gift during Easter and spring. It is also called the Lily of the Nile by some for its native land. This perennial is evergreen in some areas and deciduous in others. In the wild it grows along streams and rivers in warmer climates. It is often grown indoors as a houseplant or in a garden location. Zantedeschia aethiopica includes species such as Calla aethiopica. These are typically a creamy or milky white in appearance for blooms. White lilies are the more traditional color for these popular blooms. Pale pink is another possible option for the flowers of this plant. These are often found as houseplants but may be used in gardens. Pink is a top choice for a flowering garden or landscape plant. Shades of orange have also been cultivated for use as cut stems. Bright orange and bronze shades have been developed for blooms. Bright reds and deep yellows may also be found through cultivation. Black lilies are an unusual take on the traditional white colors. These feature maroon or deep plum as well as rich black for blooms. They have a striking and unusual look that makes them recognizable. Popular hybrids include Black Crusader, Black Pearl and Black Star. They can be cultivated for gardens to create a strong visual display. They may be planted together for a dense show or mixed with white. Its many colors make this a prime choice for mixed flower arrangements. Their unique shape can be used to compliment only certain types and styles of bouquets, but can be used effectively to create wonderful spectacles of beauty. Within Springfield, MO, Riverside, CA, San Jose, CA, Aurora, IL, and Downey, CA they are popularly used for traditional sympathy and unique/tropical expressions as well. These plants are grown after planting bulbs directly in the ground. They spread by creating new bulbs that will develop into plants. This makes it easy to divide lilies and thin out heavy clusters. Almost any soil is suitable, making it a hardy and versatile plant. It is not necessary to enhance soil as long as it is at least average. Very rocky or clay filled soils may need to have additives mixed in. The humidity is an important concern for growing outdoor plants. To create more humidity, mulching is often added around the bases. Care should be taken to avoid crushing stems or causing rot on them. Some calla lily species thrive in full direct sunlit locations. The bulb information will often list whether full sun is acceptable. Others often prefer bright indirect light, such as partial sun. Partial sun often includes a few hours of full sun during the day. This will allow for bloom growth and encourage leaves the flourish. Light is also a key factor when planting in boxes or containers. Deep containers can be used to create a lush bloom and leaf display. A single line of flowers can be used to line a window box for decks. They are also used for creating borders along garden edges and paths. Black lilies are used to convey elegance and mystery to others. These are not as widely used for bouquets as white varieties are. There is a misconception that they are associated with negativity. White lily is often used in wedding bouquets and table centerpieces. They represent beauty, elegance and innocence as well as pure love. Calla lily can also represent a new beginning in love and in life.